Wireless. We use it every day but what happens when it isn’t reliable? Wireless (or WiFi) is so common that people often use WiFi to mean that they have an internet connection. But the little signal on your phone or computer just means that you are connected to a network, and it’s the network itself which needs to be connected to the internet. This is why you can sometimes have a fast broadband internet connection but your laptop or mobile device still has trouble connecting and loading things from the internet. In this situation it isn’t the internet connection that has the issue, it’s the wireless connection to your local network. We’ve all tried to improve the signal on an FM radio by moving the aerial around etc. but it is a lot harder to do that with the wireless on your laptop because it is far more complex. You can try to get close and have less obstacles between your laptop and the access point. (Obstacles can be walls, appliances, furniture and even humans.) But the best way to get a good wireless connection is have your wireless network set up carefully so that it gives coverage wherever you want to use it. Here are three tips for improving your home or small office wireless. Likely as not, your ISP sent you a cheap-and-cheerful router with wireless connectivity. While there is limited performance you can get from these routers, there are a few ways you can get the most out of them. Reduce the number of wireless devices. Instead of using wireless to connect your printer or desktop computer, physically plug them into your router. This usually gives those devices better connectivity and it also improve wireless for other devices as the load on the wireless access point is reduced. Install it in a central location. Often, the wireless access point lives in the corner of the room or in the far corner of the office. Where do you usually use the wireless? Maybe consider moving it to a more central spot. Mount it correctly. If you leave it sitting under the desk in the corner of the room, your connectivity is going to suffer as you get further away. Start by putting it higher up without obstructions, preferably mount it to the recommendations for that unit, and that is likely to be the ceiling. If these three tips don’t help, consider investing in some better equipment. In an office a good internet connection is vital to daily business. This is why it’s worth getting an expert in to set things up for you. As a wireless engineer, I know all too well how many things there are to consider when designing a wireless network. This is a specialised area and for the best setup, you need the best expertise. One project I did was for a primary school which had a lot of separate buildings over a large area, you can watch a short video about that project here. An office might have a smaller physical area than a school but it usually has higher throughput requirements. No matter what situation or business you are in, fast internet as well as a reliable wireless connection makes it quicker and easier to get your work done. 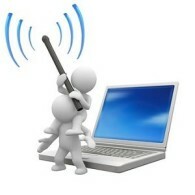 If you want to improve your wireless network, contact me; I would be happy to talk with your further.